The painting, from 1755, titled Eight Horses, has been put on sale for the first time by its undisclosed American owner, who is selling the rare piece in Hong Kong at a time when buyers are turning to durable investments such as classic artwork amid volatility in other assets. 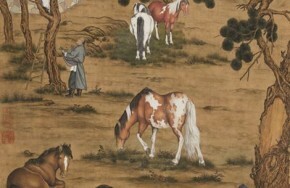 The painting depicts horses among humans using a richness of colour characteristic of European Renaissance artwork with techniques the Jesuit acquired in Milan before being drafted as a court painter in Beijing in 1715. The work hails from the painter’s later period once he had accrued considerable acclaim and the esteem of the Qianlong ­Emperor. Horses were a particularly popular subject for paintings commissioned by royalty owing to their association with prowess, travel and vanquishing enemies. Castiglione, who adopted the Chinese name Lang Shining, took on Chinese conventions of composition and brush work, helping to establish a new court aesthetic. During his 50 years in China he served under three emperors.